The band has been together for over 16 years now. It’s odd to think about the events that lead to the forming of the band. Odd to think about the naming of the band. When we formed up we did all traditional music. Jigs, reels and songs from the British Isles peppered with the occasional sea shanty sung by Joe in his rich, deep voice with Greg and I providing the bully-boy chorus. One of the sea shanties we sang was “Blow The Man Down” which referenced a sailor who ran afoul of the law when he is accused of being a crewman of the infamous Black Ball line and defends himself by claiming to be a Flying Fish Sailor just in from Hong Kong. In the days of tall ships the various trade and passenger routes were plied by different sailing companies. The “Black Ball” line had a reputation of having the fastest packet ships sailing between the UK and America. The faster you got to your destination and back, the quicker a sailor would paid and get back to England. The success of the Black Ball line depended on a strong captain who was quick with the lash who would tolerate nothing but complete dedication to the task at hand to ensure the profitability of the voyage. One could imagine that a sailor from one of these ships might cause a wee bit of trouble when returning to port in the UK and might come under the scrutiny of watchful policeman. So I suppose that we picked that name primarily because of the reference in the song. The double meaning of the term used by a sailor to alleviate suspicion when confronted by the authorities combined with the idea that a Flying Fish Sailor enjoyed the more recreational destinations of the Far East and Asia also has significance. Plus, the image of a Flying Fish is quite whimsical and people seem to like to say the word “fish” a lot and the nick name “The Fish” has stuck with us to this day. For South away and Eastward Ho! Is the road for the flying-fish sailor. That’s known to the flying-fish sailor. 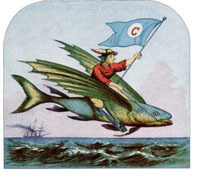 You’ll hear from the flying-fish sailor. The way of the flying-fish sailor. Shine down on the flying-fish sailor. All’s one to the flying-fish sailor. Will smile on a flying-fish sailor. You will be notified of changes to this site….that means when shows are posted you will get an e-mail! High-tech Fish! 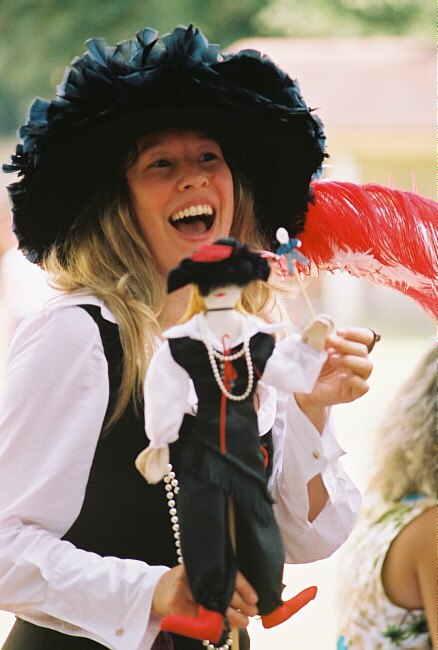 We are playing every weekend at the Texas Renaissance Festival. Come on out and join in the festivities. Cynthia has even made some new puppets! The Flying Fish Sailors are now available online in blog form! Add us to your RSS aggregator and get updates as we post them. I will be sprucing this site up with good content. The gallery is still in place at www.flyingfishsailors.com/gallery.